Where to Hunt During the Rut: Some hunters are lucky enough to live in the country. They do not have to travel far when the hunting season starts, sometimes not even further than their own backyard. Maybe you are one of such fortunate people who see enough deer visit their gardens throughout the year. Everyone else though would have to look a little further when deciding where to hunt during the rut. In this article, I will share my 3 best practices to help you decide where to hunt during the rut. Hunting on public land may be the only choice that a lot of people have. It is true that this can sometimes be harder because of the competition that you will face. But hunting on public land also brings rewards. It can also be very productive but you will have to put the hard work in. Actually, it is quite easy to find public places which are open to hunters. The first thing you should do to find a list of places where hunting is permitted is to check the game agency website of your state. Another good way to find out areas for hunting is to call the US Fish and Wildlife Service. You can call and ask them if they can recommend any sites in your local area. You can also try reaching out to your state’s Wildlife Resources Commission. 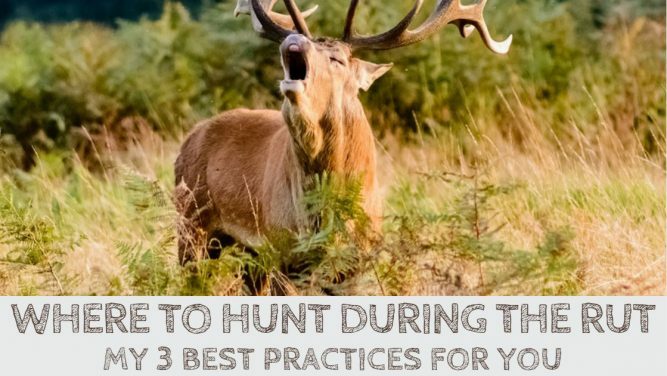 If you let them know that you are novice hunter or a deerstalker then they may also be able to offer you some helpful advice. There are numerous other factors that can affect price so you may find that prices vary across the country. When you have decided where to hunt during the rut, whether public or private land, then you need to purchase a map of the area. Maps that have topographic features noted on them will probably be the best choice. It is a good idea to go out and explore the area with your map before you go hunting for the first time. You may want to make notes on your map about whether there are any deer signs posted and whether there is an availability of food and drink. There are also other notes that you can make on the map. Your notes may help you when you do come to hunt for the first time. This includes things such as sightings of deer that you have made and the times and dates that these were spotted. Talking about timing and dates, you may wish to read When is Rut Season for Deer to learn about best time to plan your next hunting trip. Please check local rules and regulations before you go hunting.